within every operation of our business. Adopting a business culture that focuses on quality performance enables us to achieve outstanding customer satisfaction by conforming to their requirements on time, in full, every time. Bii’s quality control systems are continuously reviewed. Suppliers and maintenance facilities are monitored for compliance with regulatory and industry regulations. All components are supplied fully certified and traceable. We are a member of the Aviation Suppliers Association which promotes safety, regulatory compliance and ethical business practices among aviation parts suppliers throughout the aviation community. Bii operates an ISO 9001: 2015 and FAA AC 0056-A Quality Assurance Programme. 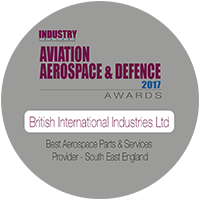 The scope of this certification covers dealer, stockist and distributor of aerospace parts including management of repairs, overhauls and exchanges.